In May of last year writer Jeff Buhler, who penned the screenplay along with David Kajganich, talked about the remake. When asked what fans could expect to see he confirmed that we’d see the family, Louis, Rachel, Ellie, and young Gage, and that we may see Victor and Zelda. So it didn’t sound like a sure thing. We saw Victor in the official trailer, and I think there may have been a quick glimpse at Zelda in there as well but I’m not sure. Victor is also in this TV spot but it’s Zelda who steals the show. It’s only one or two creepy seconds, but it’s enough. Pet Sematary is directed by Kevin Kolsch and Dennis Widmyer (Starry Eyes), and also stars Jeté Laurence and Hugo Lavoie. The movie is set to be released in theaters this spring on April 5th, just as the world outside is coming back to life. They don’t come back the same. 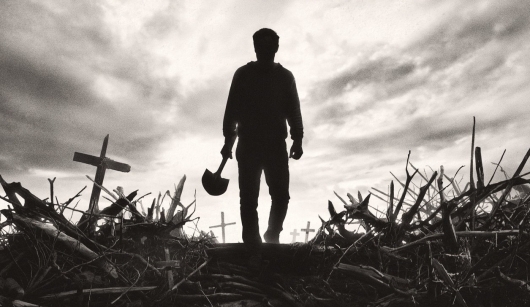 Based on the terrifying novel by Stephen King, Pet Sematary is in theatres April 5th.